1 of 7 Heat oven to 350 degrees . Coat an 8-inch square baking dish with nonstick cooking spray. 2 of 7 Beat cream cheese, sugar and preserves until smooth. Stir in sour cream and scrape down sides of bowl. Add cornstarch, vanilla and salt. Blend on low speed. Add eggs, one at a time, blending well after each. Pour into prepared pan, spreading level. 3 of 7 Bake at 350 degrees for 45 minutes or until set in the center. Cool on a wire rack to room temperature, then refrigerate overnight. 4 of 7 Use a small scoop to shape cheesecake into 1-inch balls (start at center of pan; dont use browned edges if possible). Roll cheesecake balls between your hands and place on a wax or parchment paper-lined baking sheet. 5 of 7 Melt white candy in microwave, as per package directions, about 1 minute. 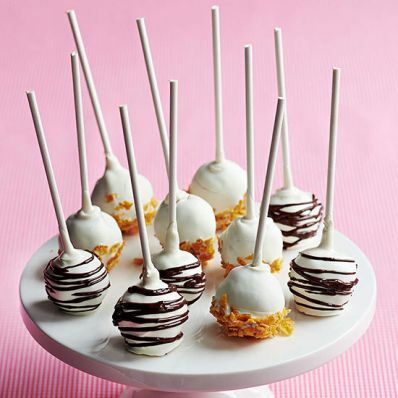 Dip each stick into melted candy and insert into cake balls. Freeze for 30 minutes. 6 of 7 Re-melt candy if needed. Have cornflake crumbs ready in a small bowl. Remove half of the cheesecake pops from freezer. Dip to coat in white candy, shaking off excess. Dip bottom halves of pops in cornflakes crumbs to resemble a crust. Place upright on wax paper. 7 of 7 Melt semisweet chocolate in microwave for 1 minute. Stir until smooth and transfer to a small resealable plastic bag. Remove remaining pops from freezer and dip in white candy to coat. Shake off excess and let dry on wax paper. Snip a small corner from bag of chocolate. While spinning pops in one hand, drizzle chocolate in a thin spiral pattern. Refrigerate pops until serving. Per Serving: 97 mg sodium, 2 g pro., 0 g fiber, 15 g carb., 8 g sat. fat, 40 mg chol., 11 g Fat, total, 171 kcal cal.